Most of our hand-crafted bridal jewelry can be sized down for the younger ladies in your wedding party. Illusion jewelry can also be made for your flowergirl. Click here to see a single-strand pearl flowergirl illusion necklace. Organza jewelry can also be made for your flowergirl. Click here to see organza flowergirl bracelets and an organza flowergirl necklace. This is our classic pearl jewelry, just sized down for a younger lady. The oval genuine cultured freshwater pearls are creamy and natural in color - they are approx. 4.5-5mm in size (5mm round pearls also available - no additional charge). Pink and black (peacock) freshwater pearls are also available. You can also add Swarovski™ crystals (no additional charge). 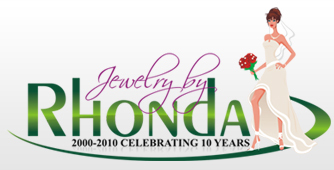 You can also have this jewelry made with Swarovski™ crystal pearls (no additional charge). We make the flower girl necklace up to 14" (we customize the length to the size of child) long with a 2" sterling silver extender. We make a matching bracelet (sized up to 5") and matching sterling silver pearl stud earrings. Flowergirl freshwater optional round pearl bracelet and sterling silver stud earrings. (this bride had several flowergirls in her wedding from 2 years old to 14 years old). Click here to see pictures of these flowergirls and what the bride wrote to me about the necklaces. Click here to read the comments this bride wrote about this set. This flower girl set is made with optional round (also called potato) pearls. Flower girl necklace and bracelet set with optional round pearls and ruby crystals. Click here to see these sets on two adorable flowergirls. Flowergirl pearl and sapphire crystal necklace made with round pearls. 3-piece flowergirl jewelry set is show with optional round pearls and light sapphire crystals. Flowergirl classic pink pearl bracelet made with optional round pearls. Special Request: Pink freshwater pearl bracelet and earrings with small sterling silver Celtic Cross B charm for baby's christening ceremony. There is also a family heirloom christening charm on this bracelet. Here are pictures from the christening... How sweet!!! After the christening, the bracelet was returned to me to make her a 3-piece classic pearl jewelry set for her adult life.